Purrstige Traits are Cattributes that are only breedable for a limited amount of time. Each Purrstige Trait has a special recipe that contains both Cattributes and hidden genes. Cattributes are the visible traits that define a CryptoKitties’ physical characteristics, like their fur or ears. Hidden genes are part of a Kitty’s DNA, but they’re not visible on Kitties; instead, they help define what kind of children a Kitty has. That means they can’t be searched on the CryptoKitties marketplace— you need third-party tools to find them. To breed a kitten with a Purrstige Trait, a player needs the right combination of Cattributes and hidden genes in the two parent cats. Breeding a Purrstige Trait can be challenging, but it’s rewarding too. Because Purrstige Traits are time-limited, they’re particularly rare—and especially valued as a result. Plus, Purrstige Traits can overwrite your cats existing visible traits to create some of the game’s most beautiful and unique cats. What do you need to breed Purrstige Traits? What are the Purrstige Traits you can breed right now? At the time of this post, there are two breedable Purrstige Traits: thatsawrap and duckduckcat. To begin, you need to decide on the Purrstige Trait you want to breed. In this example, we’ll breed “thatsawrap”. 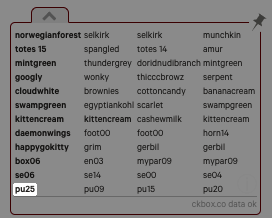 Begin by going to your CryptoKitties profile with CKBox installed. We’re looking for PU28, a hidden Purrstige gene. Unfortunately, we don’t have any kitties with PU28—if we did, the gene card would display it in bold. For any genes or Cattributes we don’t have, we’ll use Heaven.cat Finder to find them. We’ll assume we have none of the genetic ingredients for thatsawrap in this example. We need to find two Kitties: a cat with bobtail + wild gene #0 (WE00) and a cat with purrstige gene #28 (PU28). We’re not searching for a single cat with the necessary gene ingredients because it will already have thatsawrap—we want to breed it for ourselves. We need the gene in the primary position, so we click D0 on all of our heaven.cat searches. Now that we’ve found the Kitties we need to breed a Purrstige Trait, we can buy a suitable pair and start breeding them together. Yay! Do you have any cats with these hidden genes? Download CKBox, then head to your profile to find out! In CryptoKitties, there’s a particularly special kind of Cattribute called Purrstige Traits. 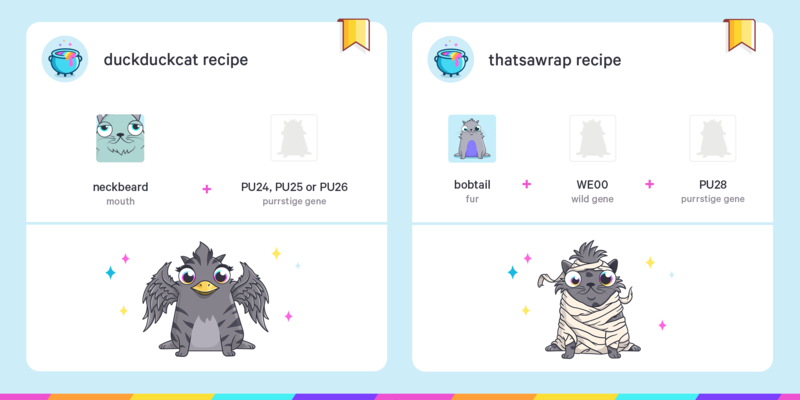 They’re challenging, rewarding, and create some of CryptoKitties’ coolest looking cats.